The 9 Best Road Races in Indiana! With running races paired along with the famous Indianapolis 500, 5K’s that let runners cover themselves in colorful chalk, and other physically-demanding marathons, Indiana has a road race for all interests and skill levels. Here are our 9 favorites. Less than an hour before the Indianapolis 500 Mini Marathon, the start and finish lines get a little warm-up with the Finish Line 5K. This one isn't a finish-when-you-finish race, this is a time challenge, and you only have 56 minutes to finish! However, the benefits and amenities are much the same as those enjoyed by the Indy 500 Mini Marathon runners, including complimentary fruit, granola bars, energy drinks, and lots and lots of water for all the runners. You'll also get an offer for discounted tickets to Angie's Grand Prix as well as a commemorative shirt and medal. 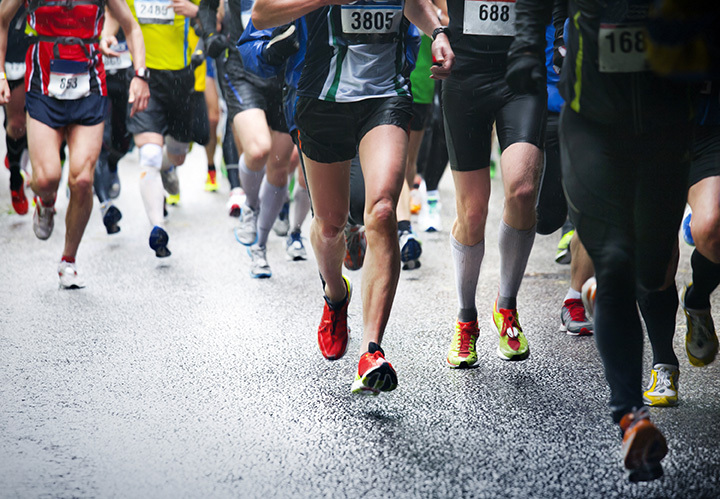 Named in honor of the Greatest Spectacle in Racing, the Indianapolis 500 Mini Marathon is a running race of just over 13 miles, making it a half-marathon and not a simple jog through downtown. The path of the race begins at Washington and West, runs to the Indianapolis Motor Speedway and completes one entire lap (which is two and a half miles, just in case you didn't know) on the most famous asphalt in the world, a section of which is the Brickyard, and then heads out of the speedway along New York Street where it finishes with complimentary fruit, granola bars, energy drinks, and lots and lots of water for all the runners (didn't we cover this already?). After cool-down stretches, runners can enjoy free post-race entertainment and admire their medals: one OneAmerica medal and ribbon to every finisher, and one “First 500” medal to the first 500 finishers that cross the finish line. For those who wanted to take on the Color Run but missed it when it was in Indiana, the Color Vibe 5K is a great alternative. With runs in Bloomington, Evansville, Fort Wayne, and others, the Color Vibe is a splash chalk race where white is definitely the color to wear! It's also a great way for kids to get involved in fitness. With all the colors, what kid could possibly be bored?! The Color Vibe 5K is a national tour and does occur in dozens of locations across the country, but there are several locations in Indiana where you can get splashed with color! Not quite ready for a 5K or mini marathon? OrthoIndy sponsors the Miler Series, a late-winter/early-spring triplet of races of three, six, and 10 miles. Since it's chilly, you're welcome to hang out in the Banker's Life Fieldhouse, the starting and ending point of the races. After the race, enjoy refreshments and cool down while you wait for your results. It's a great way to stretch your legs for May's Finish Line 5K and Indy 500 Mini Marathon, but you don't have to be registered for either one to participate in any Miler Series race. Alternatively, check out the link above to find out how you can still be part of the Miler Series even if you're not in Hoosier territory! If walking is a little more your speed, step on over to the Race for Literacy in Bloomington. It's a track through a residential area with “corners and gentle grades” as listed on the website. It is a 5K, so there's plenty of time to enjoy the scenery and chat with your race buddy (or buddies). The Race for Literacy is a charity race, with some of the proceeds going toward a local charity called Teachers Warehouse, providing free classroom supplies for teachers in surrounding counties. Grab some of your friends and become a runner with a cause. It's exactly what it sounds like … a 5K run/walk to help you with any New Year's resolutions that involve getting fit and/or being more active. In the north corner of the state not far from Chicago, the Resolution Run takes place on New Year's Day and includes a one-mile fitness walk for those just dipping their toes into the realm of exercise. The course is close to Valparaiso University, where registration is conducted and awards are given. In Fort Wayne, toward the beginning of February, runners gather to run in the Fanny Freezer, a 5K run in Shoaff Park. If you're a running enthusiast and part of the Fort Wayne Running Club, you'll be interested to know (or perhaps already do) that the Fanny Freezer is the first in the FWRC's Points Series, so make sure your membership is up to date. It's still early enough in the year that if you hadn't decided on your New Year's fitness resolution, or have just been dragging your feet—pun intended—on follow-through, the Fanny Freezer can help you quit sitting around cold turkey. Again, pun shamelessly intended. If you're a fan of putting your exercise to more than one good use, check out the Race for the Warrior, a fundraiser for a Fort Wayne charity supporting military personnel. The Fort Wayne Base Community Council's Military Support Fund offers one-time emergency relief for service members experiencing extreme hardship. The race takes place at the Fort Wayne International Airport, but don't worry, you won't get run over by landing gears. Listed in Runner's World as one of the “Best Marathons for First Timers,” the Indianapolis Monumental Marathon is a full marathon, but is accompanied by a half marathon, 5K, and a kids' fun run. The 26-mile race begins and ends at the capitol building and runs through historical neighborhoods and passes famous Indiana landmarks, hence the name Monumental Marathon. Runner ranks have included U.S. Olympians and thousands of Boston Marathon runners … last year’s Monumental Marathon supplied the 10th greatest number of Boston Marathon qualifiers out of all national marathons. Portions of registration fees go to charities to help impact the community in a positive way. View more Indiana Road Races.